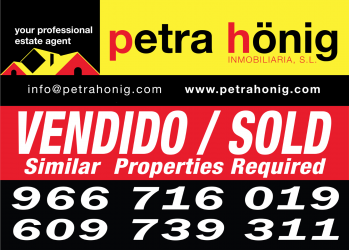 Sell your property on the Costa Blanca with Petra Hönig. If you own a property in Quesada, Villamartin or Guardamar or anywhere on the Costa Blanca that you wish to sell – Petra Honig will offer you total support in the whole Spanish property selling process. Our experienced assessors and sales staff will advice you as to the correct market price and we will use all our marketing expertise to achieve a successful result for the sale of your Spanish property on the Costa Blanca. In addition to the usual advertising and website marketing we work closely with up to 150 independent Spanish estate agents here on the coast to give you access to the largest possible market place of potential buyers. We work on a success only basis and will not make any charge until a successful result is achieved. We are continually working to improve the effectivenes of our marketing strategies. In this technological age the internet is by far the most effective tool and for this reason the properties we have for sale are presented through the website of our numerous european partners and also through many of Europes most successful property portals. If you have any queries, please do not hesitate in contacting us. Hier kunt u nieuws lezen over onze activiteit, de onroerendgoedmarkt in Spanje, o de nieuwste evenementen in la Costa Blanca. Bekijk het eens.